LVR celebrates Fall with our LIMITED EDITION Halloween Collection! Las Vegas Rhinestones celebrates Fall with the new Halloween Collection! This collection features spiders, bats, webs and pumpkins in earrings, necklaces, bracelets, rings and pins! 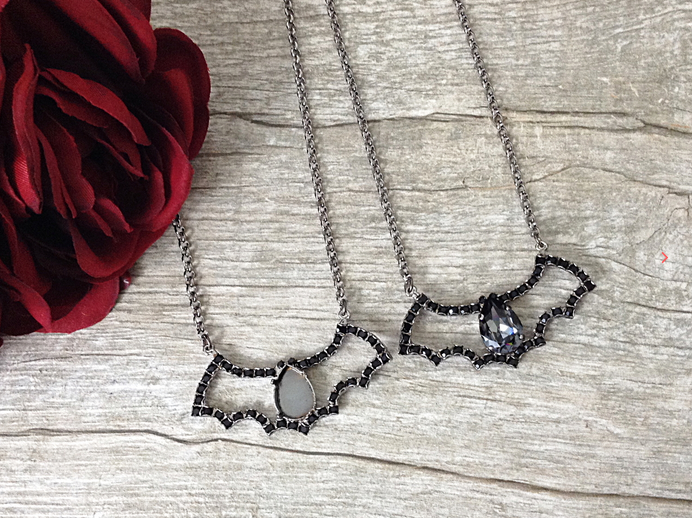 Scroll below to see more of our newly launched Halloween designs! Looking for Halloween colored Swarovski stones? We recommend using Hyacinth, Jet, Jet Hematite, Silver Night, Tangerine, Crystal AB and Red Magma! We also carry Swarovski Skull Beads in 13mm and 19mm with a variety of different colors to choose from! View our Halloween Color Collection here. Have questions? Feel free to email us at info@lasvegasrhinestones.com!